Beauveria bassiana is a soilborne entomopathogenic fungus which offers plant protection as a pathogen of arthropod pests (Feng et al., 1994; Dara, 2015). It also appears to have a direct association with plants as an endophyte, colonizing various plant tissues, or through a mycorrizha-like relationship promoting plant health and growth (Bing and Lewis, 1991; Posada and Vega, 2005; Dara, 2013; Dara and Dara, 2015; Lopez and Sword, 2015; Dara et al., 2016;). In a raised bed study conducted in 2013, treating strawberry transplants with B. bassiana resulted in a significant improvement in the plant growth compared to untreated control or treatment with a beneficial microbe-based product (Dara, 2013). To evaluate such an impact in a commercial strawberry field, a study was conducted at Manzanita Berry Farms in Santa Maria in conventional fall-planted strawberries. 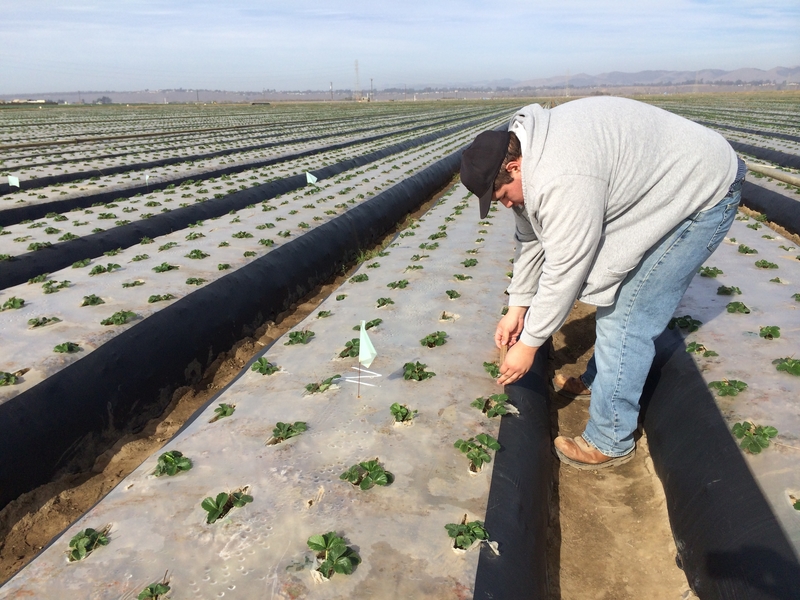 Chris Martinez, Manzanita Berry Farms applying B. bassiana to newly planted strawberry crop. 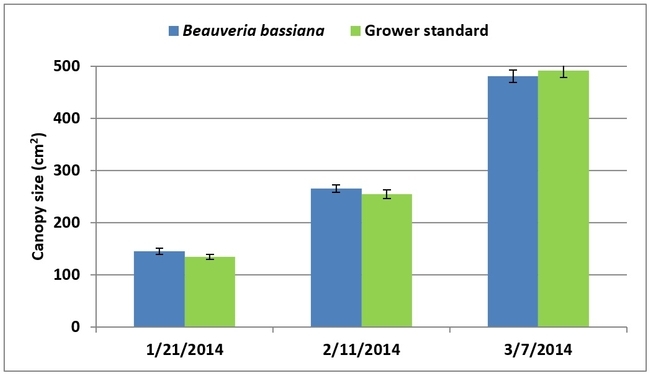 Experimental design included five plots each of the grower standard and periodical soil application of B. bassiana (BotaniGard ES) alternated on consecutive beds. Each plot had 50 strawberry plants. Strawberry variety PS3108 was planted on 27 November, 2013 and B. bassiana treatment was initiated on 2 December, 2013. To prepare the treatment liquid, 0.64 fl oz (18.9 ml) of BotaniGard ES was mixed in 1 gal (3.78 L). About 0.4 fl oz (11.8 ml) of the liquid was applied near the base of each plant (5 cm deep and 2.5 cm away from the plant) in B. bassiana treatment using a handpump sprayer. Application was continued every week until 13 January, 2014 (a total of seven times) followed by six biweekly applications until 7 April, 2014. To determine the impact of B. bassiana on plant growth, size of the strawberry canopy was measured across and along the length of the bed from every third plant (20 total) within each plot on 21 January, 11 February, and 7 March, 2014. Yield data were collected every 2-3 days from 8 March to 30 June, 2014 following the normal harvest schedule. Data were analyzed using analysis of variance and Tukey's HSD test was used to separate significant means. About 5 weeks (above) and 14 weeks (below) after transplanting. Chris Martinez taking canopy measurements. Canopy size was slightly higher for B. bassiana-treated plants on the first two sampling dates and for the grower standard plants on the last observation date although differences were not statistically significant (P > 0.05). 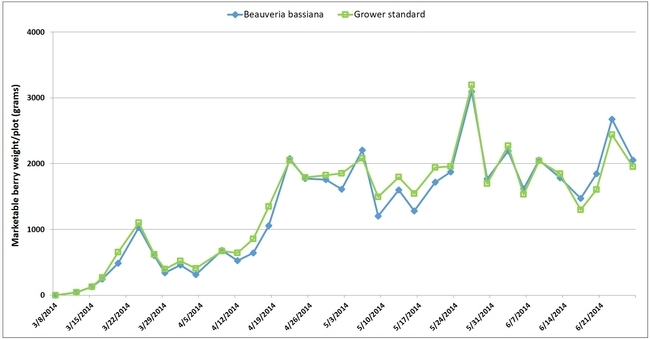 Seasonal total for the marketable berries was slightly higher in the grower standard (101.1 lb or 45.9 kg) than in B. bassiana treatment (44.2 lb or 97.4 kg), but the difference was not statistically significant (P > 0.05). The average weight of marketable berries was 28.8 g from the B. bassiana-treated plots and 28.7 g from the grower standard. 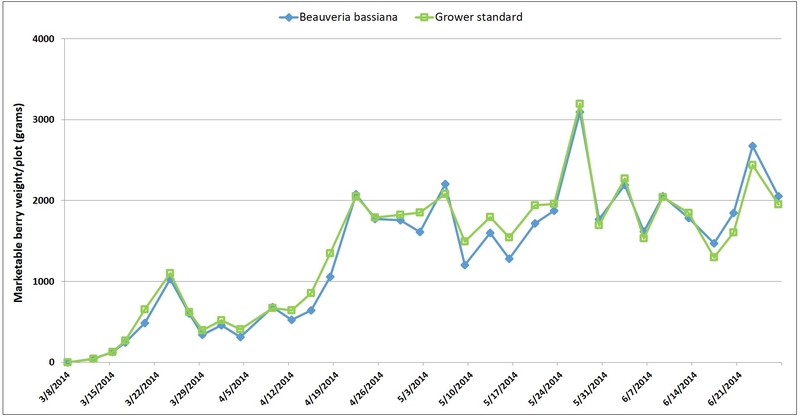 Strawberry canopy (above) and seasonal yield (below) data in B. bassiana-treated and grower standard plots. 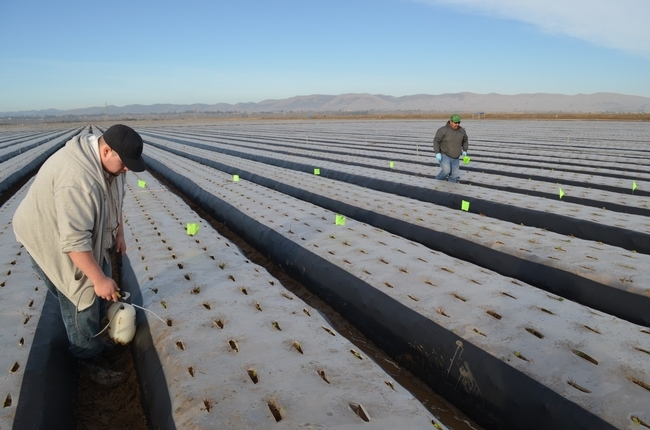 In the 2013 raised bed study, roots of the misted tip strawberry transplants were treated 48 hours before planting by applying 1 ml of the Mycotrol-O formulation (2.11X1011 conidia) in 1 ml of water per plant. In the current study, transplants could not be treated before planting and the commercial field application rate used (1.25X109 conidia) was much less than the rate used in the raised bed study. Although multiple applications were made for several weeks during the current study, B. bassiana did not have any impact on plant growth or fruit yields. This was the first commercial field study evaluating the impact of B. bassiana on strawberry plant growth and yield. Plant, soil, and microbe interaction is very complex and is influenced by multiple factors. Additional studies are necessary to understand the potential of B. bassiana and other entomopathogenic fungi in plant production in addition to its role in plant protection. Acknowledgements: Thanks to Dave Peck, Manzanita Berry Farms for collaboration on the study and Chris Martinez for his technical assistance. Bing, L. A., and L. C. Lewis. 1991. Suppression of Ostrinia nubilalis (Hübner) (Lepidoptera: Pyralidae) by endophytic Beauveria bassiana (Balsamo) Vuillemin. Environ. Entomol. 20: 1207-1211. Dara, S. K. 2013. Entomopathogenic fungus Beauveria bassiana promotes strawberry plant growth and health. UCANR eJournal Strawberries and Vegetables, 30 September, 2013. Dara, S. K. 2016. 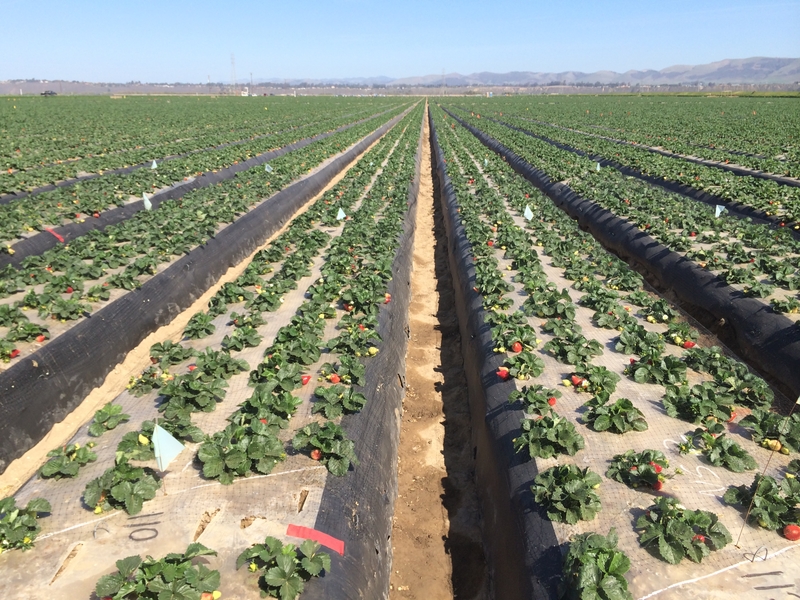 IPM solutions of insect pests in California strawberries: efficacy of botanical, chemical, mechanical, and microbial options. CAPCA Adviser 19 (2): 40-46. Dara, S. K. and S. R. Dara. 2015. Entomopathogenic fungus Beauveria bassiana endophytically colonizes strawberry plants. 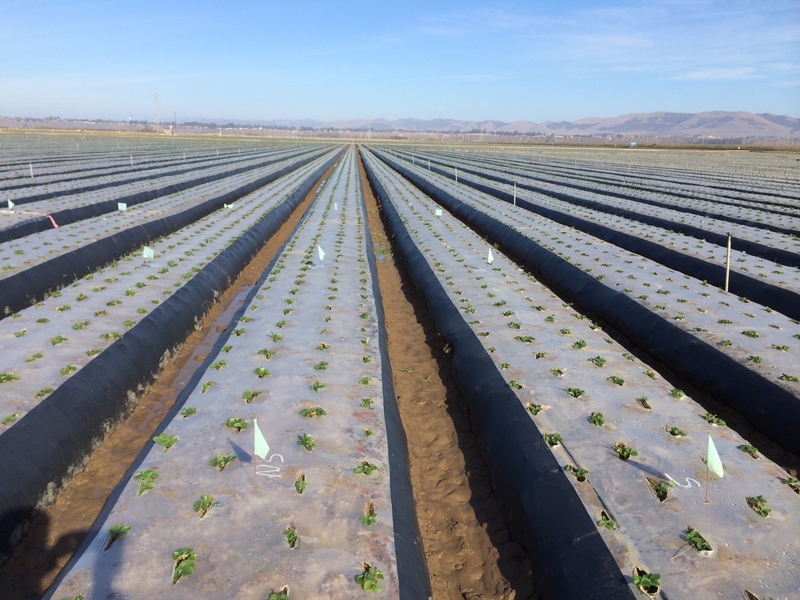 UCANR eJournal Strawberries and Vegetables, 17 February, 2015. Dara, S. K., S.S.R. Dara, and S. S. Dara. 2016. First report of entomopathogenic fungi, Beauveria bassiana, Isaria fumosorosea, and Metarhizium brunneum promoting the growth and health of cabbage plants growing under water stress. UCANR eJournal Strawberries and Vegetables, 19 September, 2016. Feng, M. G., T. J. Poprawski, and G. G. Khachatourians. 1994. Production, formulation and application of the entomopathogenic fungus Beauveria bassiana for insect control: current status. Biocon. Sci. Tech. 4: 3-34. Lopez, D. C. and G. A. Sword, G. A. 2015. The endophytic fungal entomopathogens Beauveria bassiana and Purpureocillium lilacinum enhance the growth of cultivated cotton (Gossypium hirsutum) and negatively affect survival of the cotton bollworm (Helicoverpa zea). Biol. Control 89: 53-60. Posada, F. and F. E. Vega. 2005. Establishment of the fungal entomopathogen Beauveria bassiana (Ascomycota: Hypocreales) as an endophyte in cocoa seedlings (Theobroma cacao). Mycologia 97: 1195-1200.